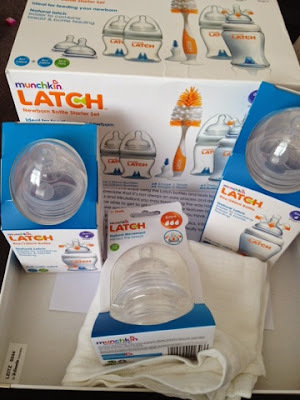 I first saw the Munchkin Latch bottles at Britmums Live and I was instantly impressed. I applied while I was there to join their panel of bloggers and test out the bottles on Elsie. Of course I had planned to breastfeed but also wanted to try expressing milk after a few weeks to introduce bottles so I could have an occasional break and give Daddy or big sister a chance to bond through feeding. I ended up introducing bottles earlier than expected as she needs formula top ups after every feed to help with her trouble putting on weight. This means I've managed to try out the Munchkin latch bottles early on. The Latch bottles were designed to mimic the breastfeeding experience, the teat moves and functions like the breast which helps to ease baby's transition from bottle to breast and vice versa. The teat stretches, moves and pumps so that baby can latch and feed just like they would on your breast. 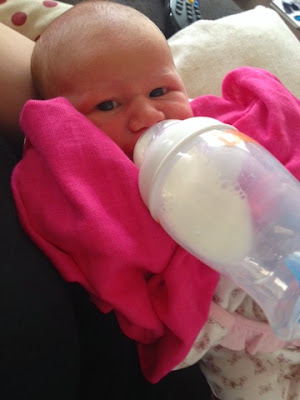 There are a few things that make this bottle unique, as well as the moving teat (most other brand bottles are shaped like a breast yet don't move or stretch like your breasts do), the anti colic valve is fitted to the base of the bottle to prevent air bubbles travelling through the milk, therefore reducing the chance of colic. You can read more about the bottles here. I was quite worried introducing bottles so early as I know that it can sometimes affect a baby's latch when breastfeeding. Elsie has been using these bottles since she was around 4 days old now and she is now just over three weeks and I'm happy to say she has no trouble latching on when it comes to breastfeeding. She is quite happy with the bottles too, thankfully the mixture hasn't got confusing for her and the bottles are really helping us to continue our breastfeeding journey and ensuring she is getting enough milk. I find out of all my babies, Elsie is the only one who doesn't tend to bring her milk back up following a bottle and I definitely think the latch bottles have something to do with that! I am very happy with the bottles, they are definitely the best I have ever tried and I can honestly say I have tried most other brands of bottles at some point with both Gracie and Zach. As you can see from the photo we were sent the newborn starter set which contains two 4oz bottles, two 8oz bottles, four stage 1 teats, two stage 2 teats and one bottle and teat brush. We also received another one of each bottle meaning we have six bottles in total which is more than enough for one days use. The newborn starter set costs around £29.99, the single bottles are around £6.99 or you can go straight for a 3-pack of bottles which is around £16.99. I have spotted them on offer at Boots at the moment though so worth doing research as you might be able to grab them at a bargain price! I wouldn't hesitate to recommend these bottles to parents especially those in a similar situation as us who need to combine both breastfeeding and formula feeding. I am very happy to still be able to breastfeed despite the problems we have had and I'm even more happy that although she needs to use bottles too, we have found the perfect solution that works for us both. The Munchkin LATCH products are now available to buy in Boots stores across the UK and online. You can find out more about the latest news and products on the Munchkin UK social media channels.